Our Adventure (Time) continues with Cartoon Network! At Pixel Press, our goal has always been to bring the ability to create video games to as many people possible - and just over three months ago we achieved the first step in that vision by releasing Pixel Press Floors to mobile devices across the globe. Yesterday, it was officially announced on Re/code and the St. Louis business Journal that Pixel Press is partnering with Cartoon Network to deliver the first branded version of Pixel Press - Adventure Time: Game Wizard - scheduled for release this winter. We’re honored to work with the team over at Cartoon Network to bring this next version of Pixel Press to life and cannot think of a better fit for our players than to be able to create their own adventure right along side uber-adventure-fanatics Jake & Finn. More on Cartoon Network's Adventure Time games and the show here and it's awesome creator, Pendleton Ward. This partnership has been a long time in the making.Cartoon Network, just like you, supported us on Kickstarter because they saw the awesome potential of Pixel Press. As a result, we’ve been working on this project since well before the release of Pixel Press Floors. It’s a big part of the reason we have been so quiet but at the same time bursting at the seams to share this news with you! When we first set out to build Pixel Press a little over a year ago, we had major features we set out to have in Floors:Android tablet and phone support, Kindle support, iPhone “create” support, larger world design with multi-sheet creation, big-square sketch sheets, story mode, advanced gameplay and creator tools, getting started mode and more.We’re thrilled that ALL of these features will be part of the Adventure Time: Game Wizard (AT:GW) release this winter. Besides more devices (Android! ), the absolute coolest feature of AT:GW will be multi-sheet design - something many of you have certainly heard us talk about before. This feature will take the depth of the creation experience to an entirely new level. As a creator, you’ll have the ability to combine up to 50 sheets of various sizes together to create a huge gaming world. On top of that, you’ll have access to a lot more creator tools than ever before (approximately 28, versus 15 in Floors - see below), and other great new features like hero swapping in-game, hero upgrades and bosses! We are also excited to be working alongside an awesome game development team in Grumpyface Studios who are handling the art, music and gameplay development. This relationship is the first step in creating tools behind Pixel Press to allow artists like you to add your own game-art, music, SFX and gameplay customizations into Pixel Press. One day, in the not so distant future, you will not only be able to use Pixel Press to design your own levels, but to create your own characters and story to share with the world! Early gameplay footage created by Grumpyface Studios below. Managing the development of Floors and the AT:GW has been a challenging task for us. Our frank inability to deliver on promises like bringing Floors to Android and adding new features has been disappointing not only externally but internally as well - however it has been the best decision to ensure AT:GW is the best gaming experience possible, and continues to deliver on what we know Pixel Press can be. For the foreseeable future, we’ve decided to focus our attention on delivering our Kickstarter promises through future products. 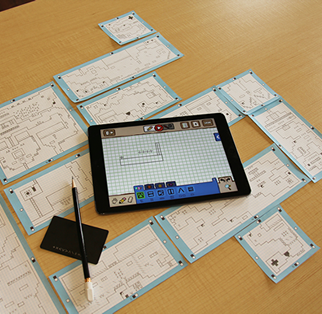 We’ll slowly add new features to Floors like the recent addition of capture-from-paper capabilities to the iPad 2 and iPad mini and the new educator lesson plans, but no specific timetable will be set for other features or future products yet. I backed Pixel Press Floors for Android, so what now? We don’t have a specific answer for this yet, but it’s our plan to make sure that everyone who backed the project at the Android-backer level (both Kickstarter and via Paypal) are awarded the AT:GW product when it is released this winter. More specifics to come. Where can I learn more about AT:GW? We will be showing of an early build of the AT:GW at Pax Prime in Seattle, Aug 28-31st. Hopefully we’ll see a few of you there! Otherwise follow us on Facebook & Twitter for lots of coverage and updates. There are also plans for a web page to share gameplay art and footage leading up to the release this winter, so stay tuned for more info on that. We’re currently working on plans for a follow up to Pixel Press Floors, to be released sometime in 2015. Stay tuned for more information on this release - and for those of you who are still holding out on remaining Kickstarter deliverables like bonus content and Kickstarter badges, please hang in there - we have not forgot about you! We hope you are excited about what we are building at Pixel Press, and if so please start by sharing a link to this post - the more people who know about this partnership the better. Also, if you have an interesting way to be a part of Pixel Press, or just want to send a note of support or feedback, please email Robin at the email address below.